There are tons of different remote desktop sharing applications available on the web, but TeamViewer still seems to be one of the most popular. With that, we have a portable version of TeamViewer which requires no installation. Essentially, it's the same as the original application but it does not require installation; you can run it from virtually anywhere including USB memory sticks and thumb drives. The application relies on computer IDs and passwords which can be set up easily by following easy directions. 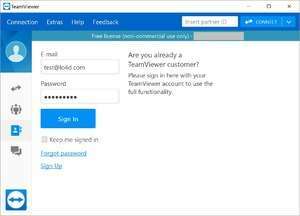 For security reasons, you should also check out the TeamViewer Portable download at LO4D.com which includes virus and malware tests. Additional screenshots of this application download may be available, too.